Before we open our new ochs und junior headquarters here in Lucerne, we’ll do a little more travelling. Something we’ll be doing off and on in the future. 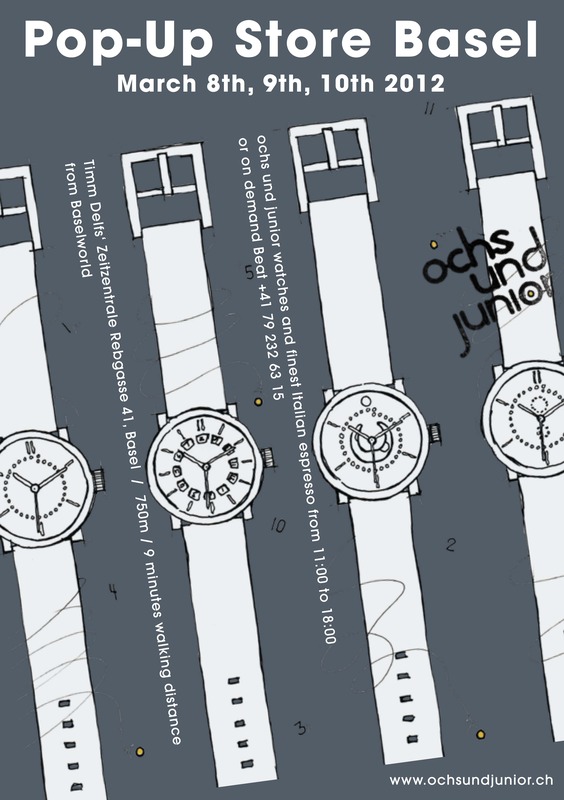 As you know, ochs und junior watches are available from us in Lucerne and via the internet. Baselworld – the World Watch and Jewelry Show – is on next week. We’ll be staffing our pop-up store between Thursday the 8th and Saturday the 10th of March – it’s at our friend Tim Delf’s Zeitzentrale. We’ll have all the ochs und junior watches there, exciting functions you can put together yourself, the world’s most accurate moon phase indication, the new anno tinta, lots to talk about and the best espresso in the whole of Basel. It really worth the short 750 m walk from Baselworld to poetic Rebgasse 41. 8.3. / 9.3. / 10.3. from 11h00 to 18h00. Call me at 041 / 266 02 12 for questions or to book a meeting.